I have to say I absolutely loved this book and am so glad that it's a trilogy because I can not wait until I get to read what comes next in this story. I haven't read a good fantasy book in a while and I'm pretty impressed with this story. To start off we have Nadya who is a Cleric, she can speak to all of the Gods. She also has been hiding away in monastery her entire life as she is the only hope for her people to restore faith in the Gods and to bring them back. Then there is Serefin, a blood mage prince from one of the powerful realms in the world and lastly there is Malachiasz, a blood mage from the same realm as Serefin. Once word gets out of her powers her home and people are attacked, Nadya must leave the monastery and is now on the run since Serefin and his army are after her. Making sure she gets away, her people stay to try and give Nadya and her friend enough time to escape. As she makes a run for it Nadya and her friend get help from Malachiasz. This book hit me with so many emotions and honestly, I love all three of the main characters, even Serefin. It's crazy, but if you read this story too you'll feel like I did, hate that you love him so much, but seeing what he goes through with his father changes the way you feel about him. The details of this story are so vivid, you can actually see it as you're reading and that's one of the things I loved about this story, it's definitely a page turner. The ending of this book left me wanting more and I can't wait until the second book comes out. I recommend reading this book if you're looking for a new Fantasy series. For more information about Wicked Saints be sure to head to the author's website. Disclosure: All opinions are my own. 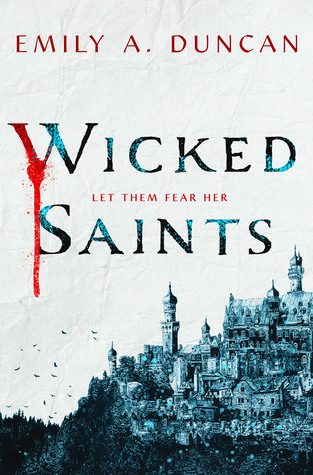 I received Wicked Saints at no cost for the purpose of this review. No other compensation was received.